Stone Crossing features 44 lots in its first phase with a total plan of 138 homes. Stone Crossing will have 18 lots adjoining the beautiful Avalon Golf Course and is only one mile from the amenities offered by the city of Farragut and West Knoxville. Both neighborhoods offer a surprisingly spacious clubhouse and large swimming pools. In keeping with the theme of comfort, quality and pride, both neighborhoods offer an easy to identify landscaped stone entrance as well as a full irrigation system for each home and all common areas. While you’re visiting, please notice the charm of decorative street lamps and matching mailboxes. To protect the beautiful views, all utilities are underground…all with one of the lowest property tax rates in the region. Some of the interior design features of the homes include: “Bull-nose” rounded sheet rock corners on main level, “knock down” finish on ceilings, gas log fireplace inserts with tile hearths, custom-built painted mantels, Merillat cabinets in cherry, maple, oak, or white, with 42” upper cabinets in the kitchen, brushed nickel or oil rubbed bronze hardware, solid surface tops in kitchen and baths, ceramic tile backsplash in kitchen, extensive trim package, and elegant lighting package. Our homes also include a fully installed security system, electric smoke alarms with battery back-up, and are wired for central vacuum systems. White Mountain Homes provides a 1-Year Builder’s Warranty as well as 2-10-Year Home Buyer’s Warranty. These are just a few of the many features offered with our homes. 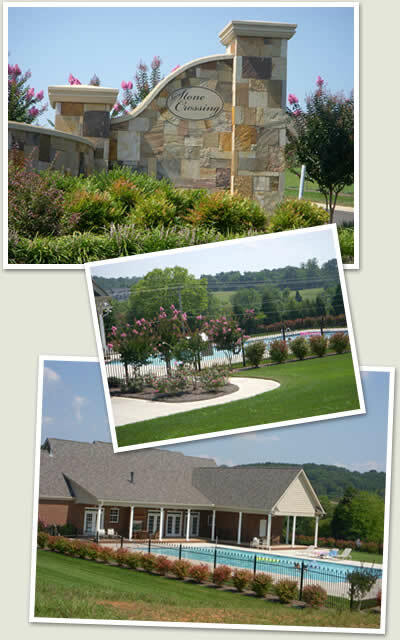 For more details or to view our homes in Stone Crossing please call Susan White (865)740-0962.